Hellen is the diamond in the pack!! 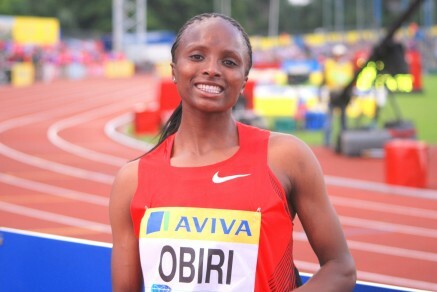 9th May 2014 – World Indoor silver medalist Hellen Obiri (KEN) ran the race of her life as she took victory in the 3000m at the opening IAAF Diamond League meet of the season. Facing World Indoor champion Genzebe Dibaba was never going to be an easy task but Obiri sat in the middle of the pack throughout the first half of the race looking relaxed as the laps counted down. With 1000m to go Obiri took closer order by moving into 4th and covering any move at the head of the field. With 250m remaining Mercy Cherono hit the front for the first time but Hellen followed her through and tracked her round the final bend. Coming into the home straight both athletes fought hard but it was Obiri who showed the greater speed and strength to cross the line in 8:20.68, a time which is a Diamond League record, a Kenyan record, an African record and the 5th fastest time ever. Earlier in the evening Jeremiah Mutai (KEN) found himself the unfortunate pacemaker in the mens 800m but he showed good fight and determination to hang on for 5th place in a time of 1:45.30. In his first outdoor race of the season Andrew Osagie (GBR) was 8th. In an exceptionally high quality 1500m Bethwel Birgen (KEN) showed good early season form taking 7th place in 3:31.22, his 4th fastest time ever. This meet in Doha marked the start of the Diamond League series which will see PACE athletes competing across the globe over the coming months.